Be prepared before you go shopping for a car. What to expect when you go into a dealership. How to be in charge of the sale. Strategically map your journey with a plan. Use insider information to have the advantage. Possible save money on your car purchase. This book takes you on a fun and enjoyable ride all the while giving you that knowing confidence when you purchase your next car, that you got a terrific deal! Purchasing a new or used car is one of the most terrifying experiences in the majority of women’s lives. 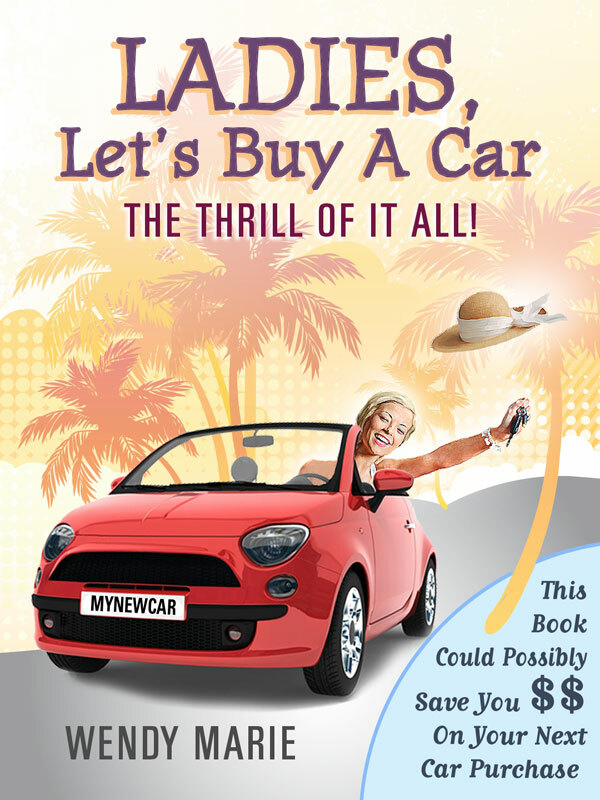 Having been in the automobile business for over 40 years, I can attest to the fact that Wendy Marie’s book, “Ladies, Let’s Buy A Car,” will be a joyful event. We don’t buy cars very often but when we do it can be a memorable event. I am going to show you how to have fun buying your vehicle and keep you in charge all the way through this safari. You may bounce up and down a few times in your safari jeep as we drive through this automobile jungle but you will quickly learn how to be in control. You will learn how to prepare for your choice of vehicles before you shop. If you have a trade, what do you do with it? You may decide on a new vehicle and then again, a pre-owned might make you happier. You can have a pleasant time with your sales person. If you have credit issues, don’t fret. Sometimes life has some wrinkles. Whether you purchase or lease, know which is better for you. Know in advance what the aftermarket products are and which ones you are interested in. This book takes out the fear and intimidation you may have had in the past. Remember that song from “Mary Poppins” that says “A spoon full of sugar makes the medicine go down, in a most delightful way”? This book has a lot of sugar. Another benefit is saving money. Your negotiations may be profitable for you. It’s a nice feeling to know you saved money on a purchase. Reading this book is like having a close friend beside you. I will share with you some experiences and true stories as we progress. I’m ready to go shopping, are you? You can purchase the book online from Amazon at http://www.amazon.com/Ladies-Lets-Buy-Car-ebook/dp/B00852BE8M/ref=sr_1_1?s=books&ie=UTF8&qid=1345581507&sr=1-1&keywords=ladies+let%27s+buy+a+car.